Who said this oft-quoted line? It was Thomas Alva Edison, the great American scientist whose inventions have changed the way of our living. A child who was labeled as a ‘dull and useless’ student by his teachers, was known one day as a genius of his time. At the age of 12, when many children live a comfortable life in their families, he was selling newspapers in trains, and one day he himself became news. To know how grateful we must be to Thomas Alva Edison, just switch off your lights. The electric power bulb which lights up our world is his priceless gift to mankind. Today, it is impossible to imagine life without electric bulb, isn’t it? However, Edison did not give us only the electric bulb. Perhaps no other scientist made so many inventions or discoveries as did Thomas Alva Edison. His total inventions are more than 1000. His first major invention was not a new thing. Before him, Alexander Graham Bell had already invented telephone and there was a telegraph system already existing in the time of Edison. Yet, it was impossible to send multiple messages at a time through these devices. 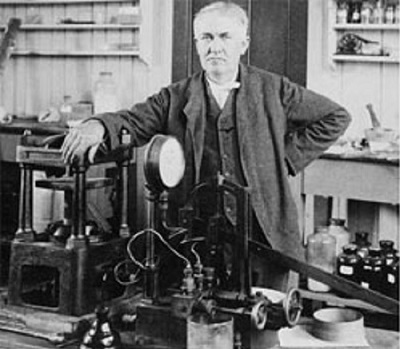 Thomas Alva Edison had a keen interest in telegraph but he could not find an opportunity to carry on his experiments. It is said that when we have a genuine desire, God helps in a mysterious way. The same happened with Edison. When he was still a child and working as a newsboy on the Grand Trunk Railway (Detroit), he saw another child on the railway track. A train was coming from the opposite side. Not caring his own life, Edison saved the child. The child's father was a Station Master and when he knew about Edison’s desire for working on the telegraph system, he made him Telegraph Operator. It was here that Edison improved the message transmission system of the telegraph and invented duplex telegraphy and carbon telephone transmitter so that multiple messages could be automatically transmitted. Modern telephone system is based on this great development. Another important invention of Thomas Edison was the modern electric bulb, as we have mentioned above. In 1879 Edison gave a public display of electric lighting at Menlo Park, New Jersey (America). In next few years many cities of America, beginning from Manhattan, were dazzling with electric light which brought a magical change in the lives of people. No wonder, people called him “The Wizard of the Menlo Park”. Though Edison made more than 1000 inventions, some of his major inventions were Electric Pen, phonograph, megaphone, kinetoscope, dynamo, electric motor, storage battery, earphone, etc. It was due to the invention of phonograph and kinetoscope that moving pictures (movies) could be made possible. We can’t imagine today’s life without cinema and the world of cinema will always remain grateful to Thomas Alva Edison. He was a great scientist whose whole life was dedicated to deep studies, hard labor, and bringing out things which could make the human life easier and progressive. As a sign of respect to this great man, electric lights were dimmed in America for one minute after his death. He died on October 18, 1931.